For anyone interested in having another go at Draw a Bird Day, the eighth is a week from today! I want to once again thank and recognize A Wing and A-Way for letting us know about Draw a Bird Day. We sa-lute you *wings raised*! This is my first watercolor (paint, not pencil) bird. I was going for loose. I think I was tightening up a bit toward the end. I shall try for a loooooooooooser version next go-round! Is it Friday yet? I think we’re getting close. I hear fireworks……. Truly beautiful and so inspiring…thank you for this!! Thanks, Inari, I’m glad you liked my painting. And wow, posting bird photos is a great idea! That’s sure to give inspiration to others who’d like to participate! I love that you’ve set up a collaboration section, too! Sounds terrific! PS you have a great day, too! Thank you, Jean! You are such a ray of sunshine! :)). God bless you too! Thank you, Kathy! I always appreciate your visits and comments. I almost didn’t post this one. I wanted a different result, but with watercolor, best to go in like you’re opening a book, wanting to see what happens. Thanks, Jodi! Glad you like it. Could be looser though? It could – but is is simply lovely how it is! It is quite loose compared to many. There are so many styles and so many degrees of “loose” Sometimes too loose is too abstract. You’ve capture the essense of this beautiful bird. I adore it. I love your color choices Laura, beautiful! I read the link to the draw a bird day and the origins, it’s a very uplifting story. I’ll join in next week and draw a bird on the 8th. Love the colors. Maybe I’ll try some watercolor for the 8th too. I do need to get back to painting. I hope you do! What do you think of the style…..too tight, too loose? A mix? I’m trying to find the right balance, and trying to find my style, I guess. Charles Reid videos are resonating right now! I look forward to your watercolor posts! I love the looseness. It goes with the freshness of the colors. Right?! Would be way cool. Lovely little Bluebird Laura! Looks like it is bringing a ray of sunshine! Aw thanks Jill! Do you think I should focus on being looser? I’m feeling like I’m watercoloring better with the looseness but I don’t wanna go too far. What do you think? Thanks for the heads up. Maybe I’ll actually manage to remember about the whole bird drawing thing this time around. I hope I’ll remember to remind everyone again, too, lol. Thanks, Laura, for keeping this going! Also, I want to wish you and your family a wonderful 4th of July weekend! Thank you so much, and to you and your family as well! Everyone is enjoying drawing and painting birds. It’s very cool! Thanks again! And the watercolor paintings are looking great as well! Thanks, Mary! I think working looser is helping. I don’t have the skill yet to really do the detail, so looser seems to free me up quite a bit. Beautiful birdie!!! 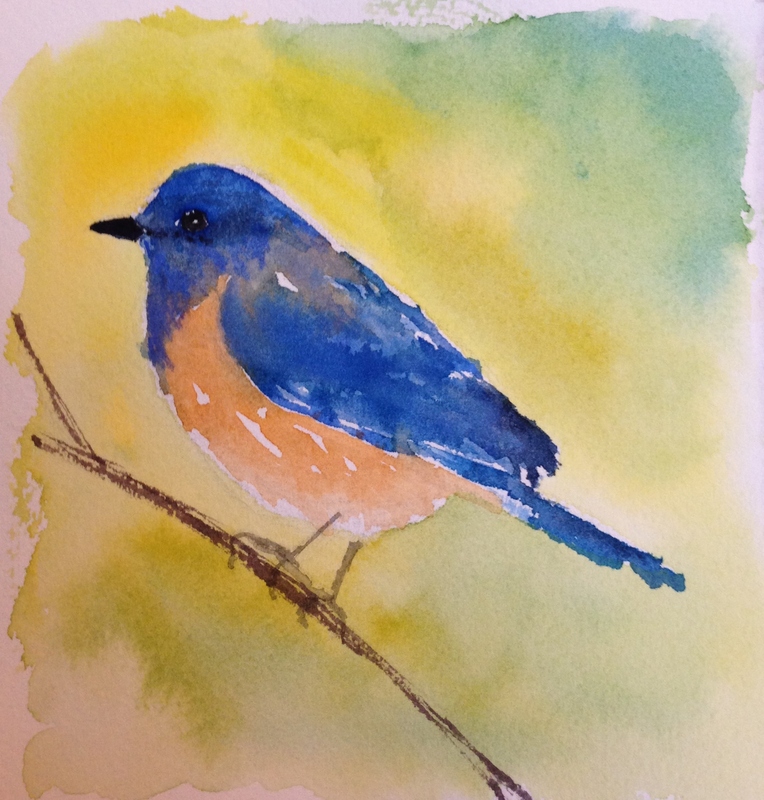 Can´t wait Draw A Bird Day – with lots of whites and splattering! 😉 Happy Independence Day to you tomorrow!! !